The results of a new wastewater study show a considerable regional variation in drug use across Europe. On March 7, the European Monitoring Centre for Drugs and Drug Addiction (EMCDDA) published the results of Wastewater Analysis and Drugs: a European Multi-City Study. By analysing urine in the wastewater of 59 cities and towns in the EU and Switzerland, scientists estimated the quantity of cocaine, amphetamine, methamphetamine, and MDMA being consumed in 2017. Researchers estimated that the wastewater of approximately 43 million people was analysed by the study. This is the seventh year running that the EMCDDA has undertaken wastewater analyses of European drug use and, in terms of the number of cities involved, it is their biggest wastewater project to date. By testing for benzoylecgonine, the main metabolite of cocaine, scientists found that cocaine use is highest in Western European cities. Among the cities analysed, Barcelona topped the list. Results suggest that 965mg (almost one gram) of cocaine was consumed per day per 1,000 people in the Catalonian capital. The particularly large quantity of cocaine being consumed here may be due to Spain being a common entry point for drug trafficking from Latin America. Numerous high-profile cocaine busts have taken place in Spain in recent months, including a 5.88 tonne haul found in December 2017, and almost 750kg of the drug found earlier this year – much of which was concealed inside pineapples. Of the top ten cocaine-consuming cities after Barcelona, five were in Switzerland, with the remainder in the Netherlands, Belgium, UK and Germany. The cities with the lowest estimated levels of cocaine use were in Northern and Eastern Europe, including cities in Finland, Slovakia, and Lithuania. Researchers found that MDMA use was higher, by a significant margin, in Amsterdam than in any other tested city. 230mg (almost a quarter of a gram) of MDMA was consumed per day per 1,000 people in the Dutch capital, the study estimated. Amsterdam, along with having a vibrant nightlife culture, is one of the few European cities which allows facilities for people to bring in their pills or powder for testing; this allows people to ascertain the contents and purity of their drug so that they can make informed decisions on how to use it, if at all. 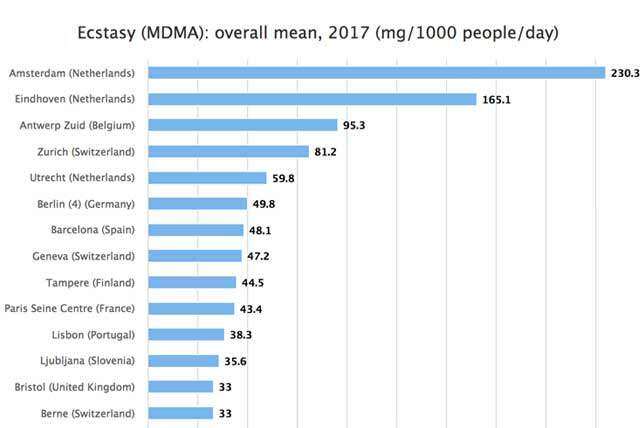 As with cocaine, MDMA use was highest in Western Europe – with Dutch and Swiss cities making up half of the top ten MDMA-consuming localities. Methamphetamine is higher towards the east of the continent, the analysis suggests. The five cities with the highest meth use are in eastern Germany and the Czech Republic, while the Slovakian capital of Bratislava also had a high rate. Germany, Belgium, and the Netherlands dominate Europe in amphetamine use, with cities in those countries making up all of the top 17 amphetamine-consuming places in the analysis. While this analysis provides insight into variations in drug use around Europe, there are limitations of the wastewater analysis approach. As the EMCDDA describes, this test “cannot provide information on prevalence and frequency of use, main classes of users and purity of the drugs”. In addition, there are other reasons - aside from use - for why drug residue could appear in wastewater, including the presence of drug processing factories. Nonetheless, the data shows a considerable variety in how Europeans take drugs – suggesting that a policy to reduce drug harms in one jurisdiction may not necessarily work in another. The EMCDDA’s report may influence policymakers to consider approaches that take the specific drug use characteristics of their city into account. Explore the data from the EMCDDA's study with their interactive charts and maps.